Dogfish Head’s Squall is an unfiltered, bottle conditioned, and dry hopped double IPA. DFH’s regular 90 minute IPA is somewhat of a benchmark beer in this realm, and is probably responsible for turning me into the hophead that I am today. 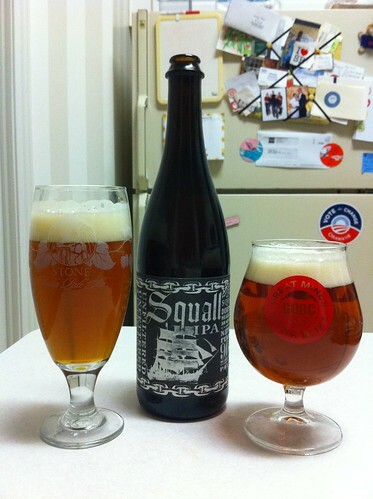 Squall, like the regular 90 minute, is a very well balanced beer given its IBU level. The hop bitterness is layered and long lasting, but offset by the body of the beer even moreso than in the 90 minute. Overall this beer has a great flavor and composition, but I think I was expecting a bit more muscle and instead got almost too much refinement.